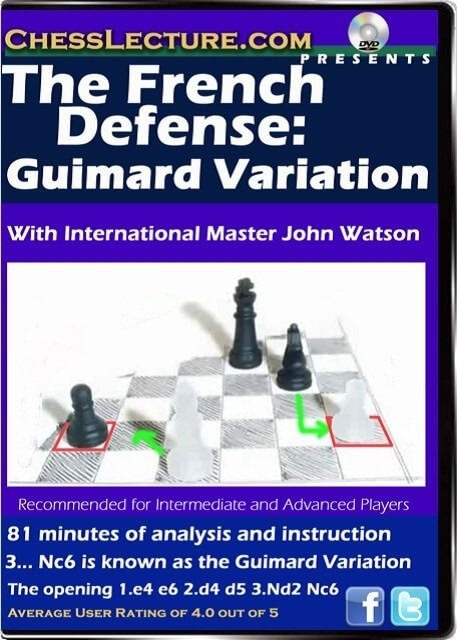 The French Defense: Guimard Variation is a chess opening 3... Nc6 is known as the Guimard Variation: after 4.Ngf3 Nf6 5.e5 Nd7 Black will exchange White's cramping e-pawn next move by ...f6. However, Black does not exert any pressure on d4 because he cannot play ...c5, so White should maintain a slight advantage, with 6. Be2 or 6. Nb3.Grandmaster Guimard was a 3 time chess champion in Argentina. Members of ChessLecture.com rated this series a 4.0 out of 5 Fans on Chesslecture.com said: I’m glad that IM Watson covered Ng5 idea for White and what kind of things that Black can do. Excellent Lecture!!! IM John Watson: is a well respected chess author with over 21 books to his credit. 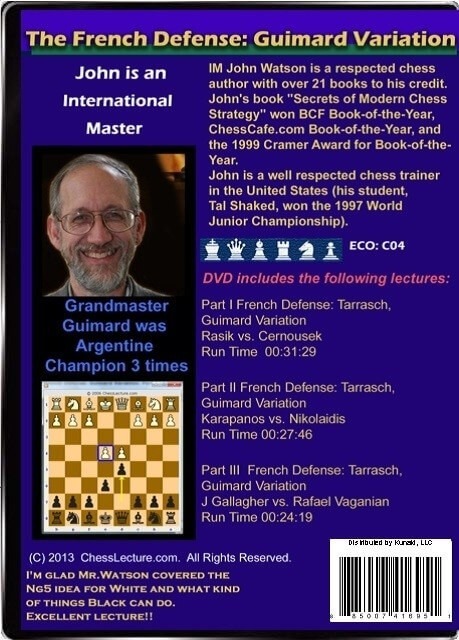 John’s book “Secrets of Modern Chess Strategy” won BCF Book-of-the-year, and the 1999 Cramer Book-of-the-year award. John is a well respected chess trainer in the United States. His student Tal Shaked won the 1997 World Junior Championship.